This year, I'm going to be brave and actually enter something... I dont know why I find it so hard to like things that *I* make, but I generally do. I say 'generally' because there is one quilt I will never tire of saying I love, and that is my first ever bee quilt. 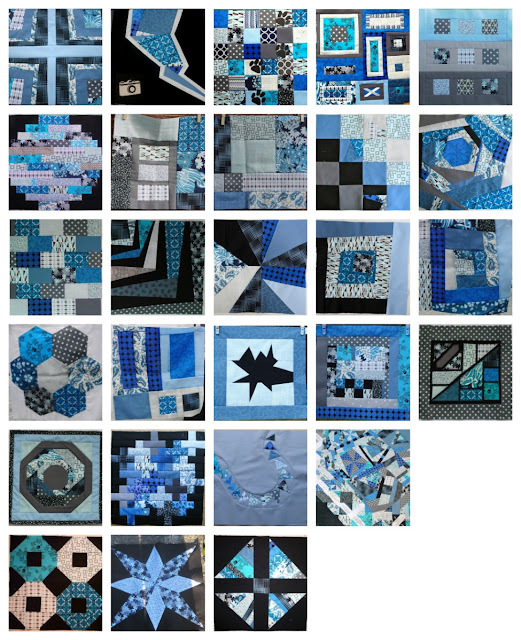 These are the fabulous and diverse blocks I received from my "do anything" instructions, and the weird mix of blue & black fabrics I sent out. As the days ran out I tried all sorts of different layouts, thought about all sorts of sashings etc. I started to panic. 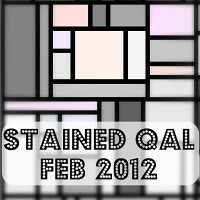 It just seemed like two quilts - traditional blocks, and modern, free scrappy blocks. Maybe it was a reflection on my state of panic, but two blocks in particular caught my eye - Ceri's block, and the random piece and slash/slash and piece section my mum did for me. I saw a lightening flash and a tornado and somehow they just whipped all the blocks up together! 5 days and nights of manic, scrappy piecing to build mums block up to 24" square, and individually enlarge each block up to 14" - in some cases making one block 14" x 16" and the one next to it 14" x 12", whatever was needed to link them - I got the top done in time. It was wonderfully, professionally quilted by Christine Marriage, (who is so, so lovely!) in a "square dance" pattern, which I think really suits the quilt top as its so random and angular. I used Moda's extra wide dottie grey to back it, and I bound it in the same kona black so that the edges disappear. It measures approximately 81" x 95". Its a bit of a beast.... my Blue Beeast.... and I love it. Quite a few people may remember seeing this quilt in person, as I took it with me to the Fat Quarterly Retreat 2012 thinking my bee friends might like to see it, and it seemed to have a life of its own! This photo is a snapshot of what is possibly one of my warmest, snuggliest, happy memories, I still can hardly believe it; when one of my absolute favourite bloggers - Lynne of Lilys Quilts - genuinely really liked my quilt! Size - approx 81" x 95"
I ADORE this layout! So creative and fabulous. Thanks for sharing. It's such a fantastic quilt. You did a great job of combining all those blocks! What a great story to go along with a great quilt! This is amazing! I love how you incorporated all those blocks into a cohesive idea. This is the best combination of the work of a lot of different people that I have seen in a long time. Gorgeous - I wouldn't get sick of it either! It's wonderful! What a great collaboration. Every time I see this I am blown away by it, and your genius at pulling it all together! Wow! I can see why you love it. I do, too!! How unusual and beautiful! That's really something to be proud of! Great quilt. As I decide some time ago, blue color can go together with blue, white and black. I love this quilt. The whole tornado thing was inspired. I don't think I've ever seen anything quite like it. Of course really I'm sure you planned the colour scheme to co-ordinate with the Barclays Advertising on the Boris Bikes :-) Every time I see pics of it I spot another little detail. 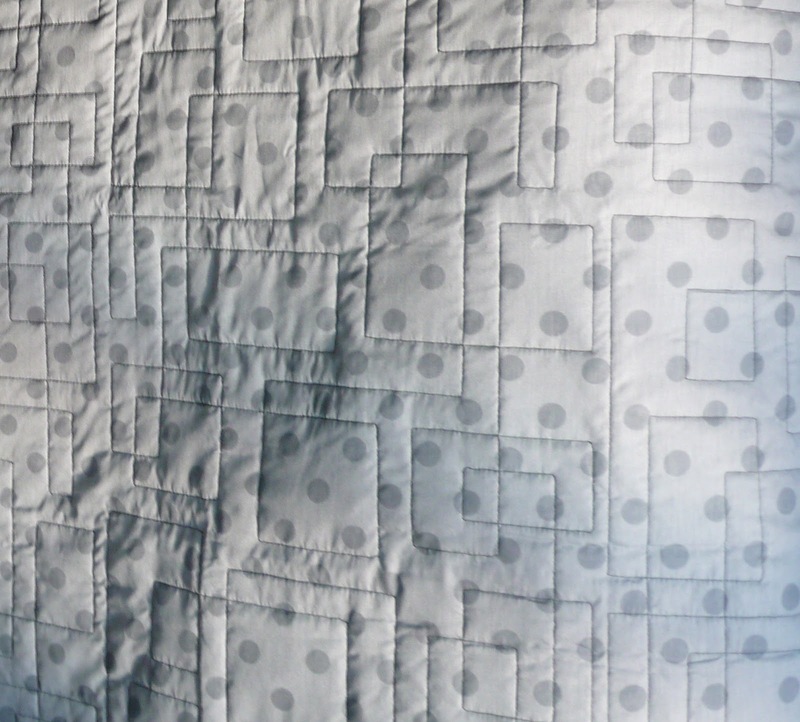 The best quilts are like this I think. very cool! I like the cool modern spin on this one. I am a lurker on your blog (and have been for about a year!). I totally love all your quilts and think you should feel so proud of your work! Congrats on this quilt, it's gorgeous! I also love how you've photographed it! i saw this in real life in London (you were hidden underneath! )and was so impressed. It's fab and all the better for being made with friends. 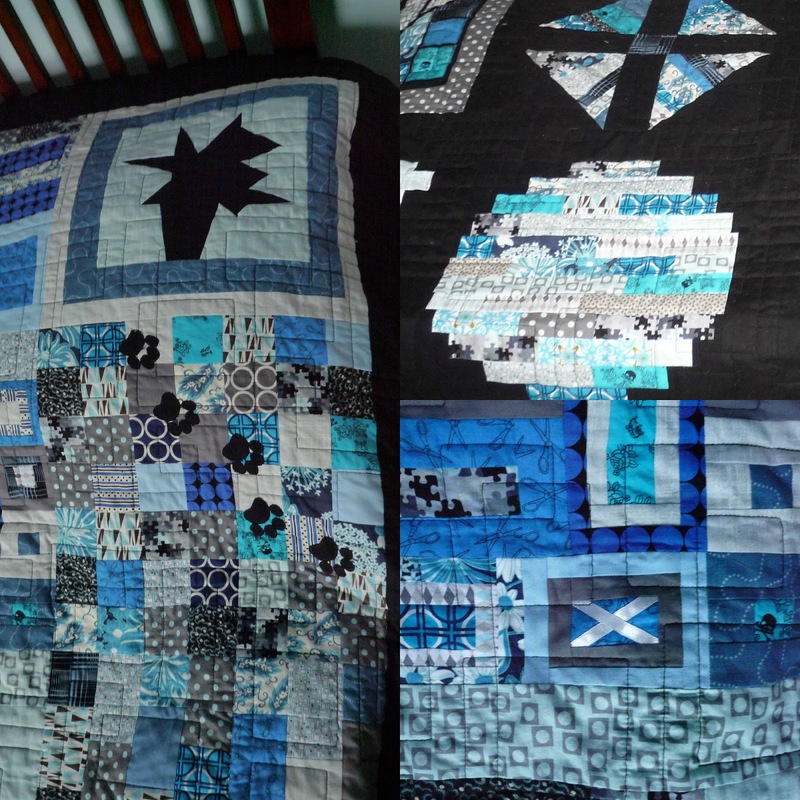 This quilt is a real explosion of wonder! You did a fantastic job putting the blocks together in a creative way. What a clever, creative setting for your blocks. 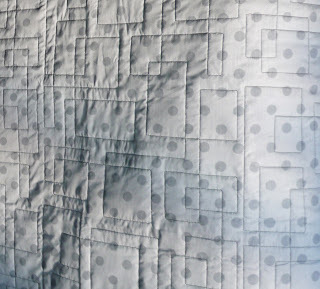 I can see why you love this quilt...it's awesome! It was great to see it in real life too! A. Certain winner! It is a fabulous quilt! Wondereful bee quilt. Amazing layout. Congrats! It breaks all the rules but is all the better for it! This is one of the most successful layouts for a random blocks bee quilt I have ever seen. I like how the top is disintegrating into the bottom. Brilliant. 'Vote for the Beeast' that's what I say! Most Gobsmackingly Awesome! Nice finish, and your photographs are so well done! It's amazing Sarah!! Good to see the FQR London photos of it again! Wow, brilliant setting for the blocks. It's fabulous. Show stopper indeed! This is fantastic! This is wonderful. 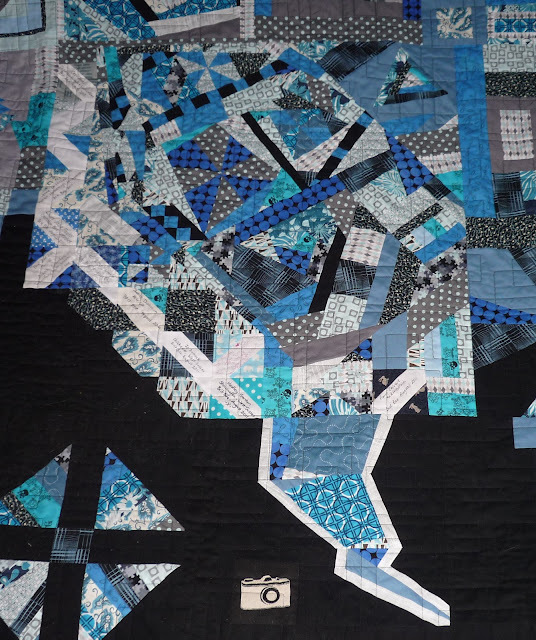 I love how you've put the blocks together and I love the pictures of your quilt in London! Thanks for sharing it. This quilt is stunning, you should be very proud of it. I am so glad to see it in the festival! It is striking, I love the way you put it together. And this photo with Lynne and Lauli is my favourite. This is so amazing and creative!! My goodness! It's simply H-U-U-G-E but lovely!